﻿ Construction drawings for repurposed scaffold wood, pallets, metal tubes. 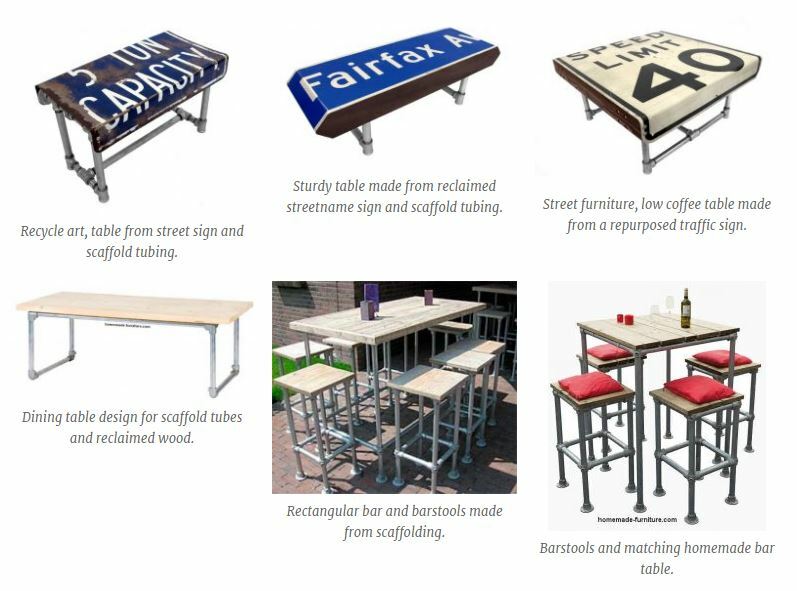 Free construction drawings to construct your own furniture from recycled materials. Garden lounge set of pallets, old planks, metal tubes, repurposed metal. Construction drawings for repurposed scaffold wood, pallets, metal tubes. Free D.I.Y. 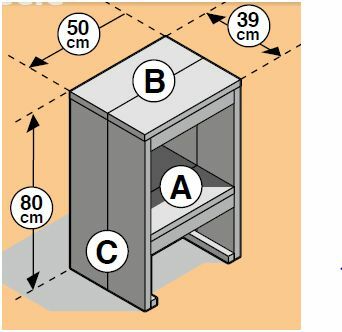 construction drawings for homemade furniture. 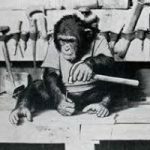 Free manuals and plans, learn to make furniture from repurposed materials. First of all, use wood from old scaffolding as one of the main materials. 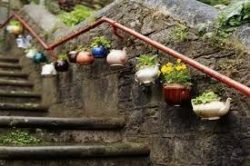 Recycling is the main purpose for our woodworking plans. We have a nice selection of drawings for tables and chairs. 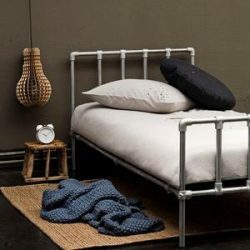 Learn how to make furniture from scaffold tubing and planks is very easy and fun. Drawings for homemade furniture explained in a step by step tutorial. We tried to make simple furniture plans and drawings. Therefore there is no need for complicated assembly methods. Selftapping screws in strategic places help to make this furniture strong. In the case of scaffolding tubes you will make these connections with special clamps. 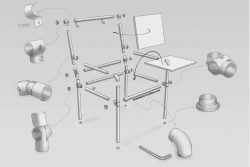 You can simply assemble the tube furniture with an allen key. Forget about dovetails and other classic methods for joining wood. Neither do you need expensive materials to achieve a long lasting quality. 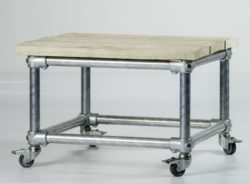 Rolling table on wheels, made from scaffolding pipes. 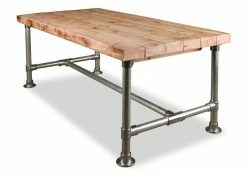 Make a steel tube rolling table frame and tabletop from repurposed scaffolding wood. This design for this rolling table is very similar to our construction draing how to make a kitchen table from scaffolding tubes. The difference in this construction drawing are wheels under the table legs. Our previous model had round metal footplates under the legs, and that made it a bit hard to move the table. Wheels with brakes completely eliminate the difficulty to move these tables. It will also prevent scratches on the floor. 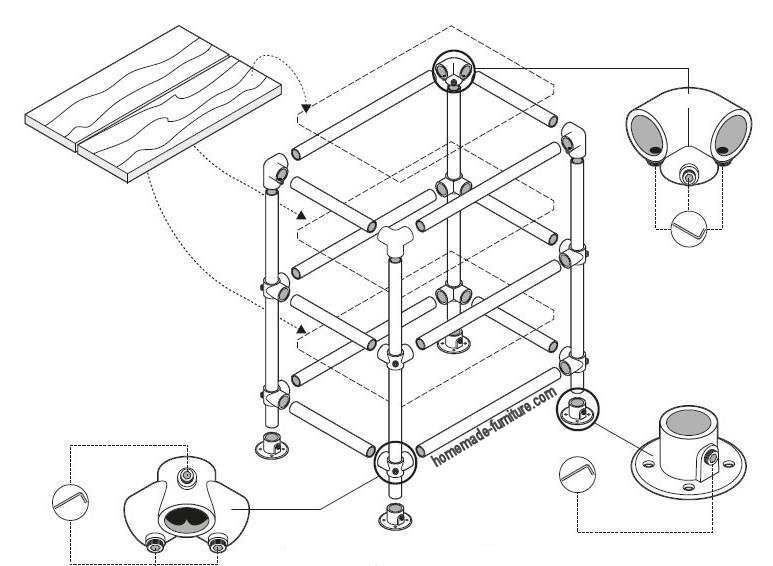 Scaffold tube table construction drawing and assembly guide. 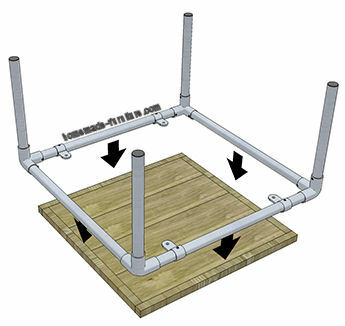 Do it yourself example for a scaffold tube table. Table frame made from 42 mm. thick scaffolding tubes. 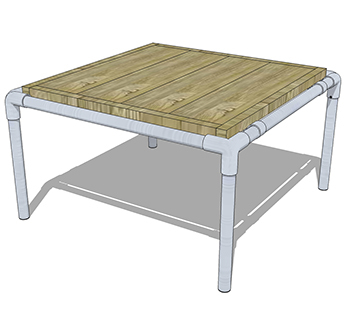 Make these tables with scaffold tubes 42 mm. in diameter. 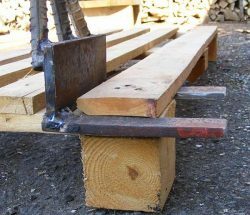 That will make the frames very strong, therefore you will have no need for extra strengthening. Nevertheless you can still use the same construction drawings for tubes that are thinner. But in that case the scaffold tube table must not be too large. This design is good to use for homemade dining tables as well as coffee tables. Crossfit fitness rack made from scaffolding pipes. Make your own fitness equipment with scaffolding tubes. A few examples of frames and racks for fitness training. Adapt the shapes and sizes to your own needs. One of the great advantages of these crossfit racks is their versatility. All parts of the frame are widely available in almost any hardware store. 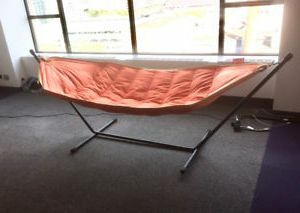 Hammock and swinging bed supports, made with steel pipes from scaffolding. Steel standards and support poles for a hammock. Homemade frame support for a hammock, made with scaffolding tubes. 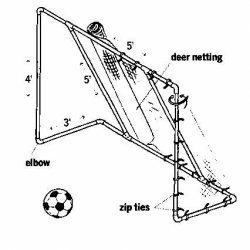 Examples how you can make a strong frame to support hammocks and swings. Tubes from scaffolding are the base material to make these frames. 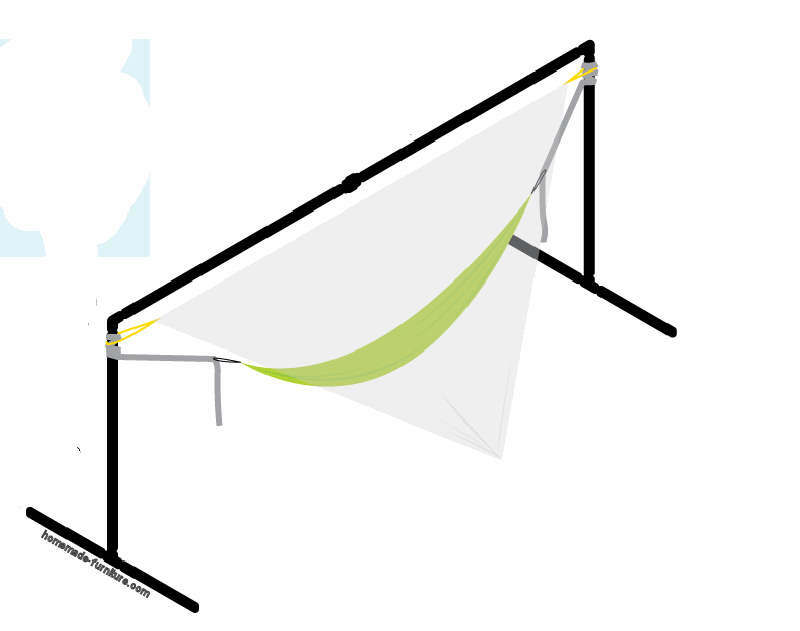 The frames can be dismantled when you do not use the hammock for a longer time. Tube clamps are available for many sizes of scaffolding pipes. We recommend that you use a fairly large diameter to make these constructions. A tube size around 40 milimeters is strong and still fairly affordable. Goal for soccer and hockey, diy construction with scaffolding pipes and tube clamps. Easy assembly method to make a goal for soccer or hockey. 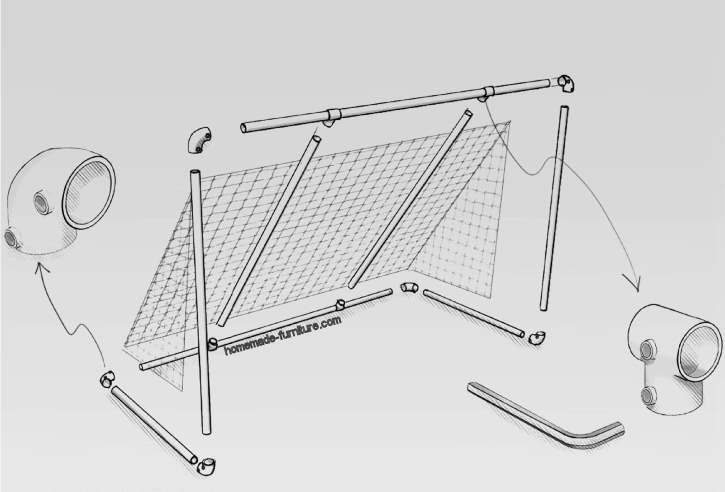 Assembly of a homemade soccer goal. 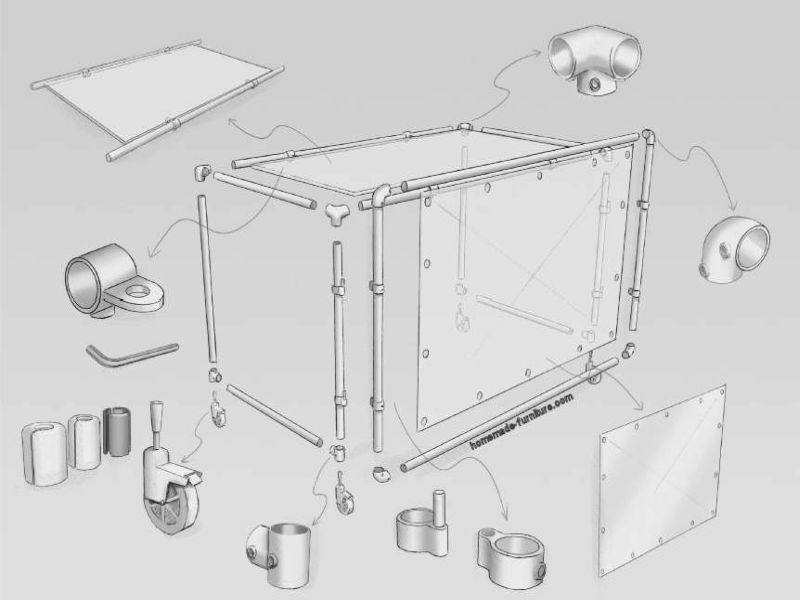 You can adapt these construction drawings and assembly methods to any size of goal. You probably do not want a full size soccer goal in the garden. Make the goals larger when the kids grow up, you only need to change the length of some tubes. One of the great advantages of scaffolding tubes and clamps is that you can repurpose all parts. Maybe you already made such a soccer goal before, with PVC pipes. 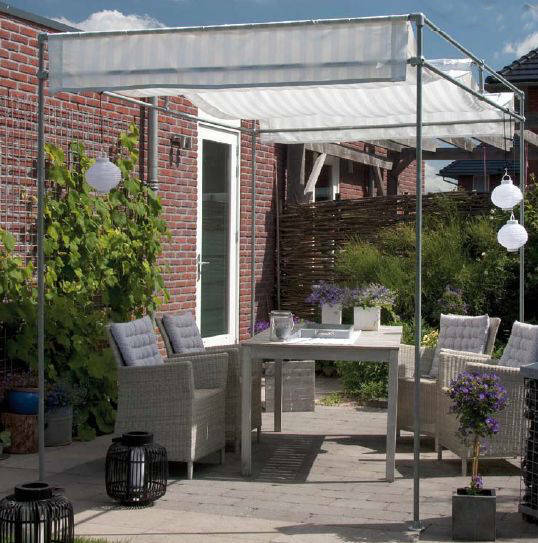 That is also a very common material to make these goals, but PVC is a lot less durable. Therefore we prefer to use steel tubes from scaffolding. 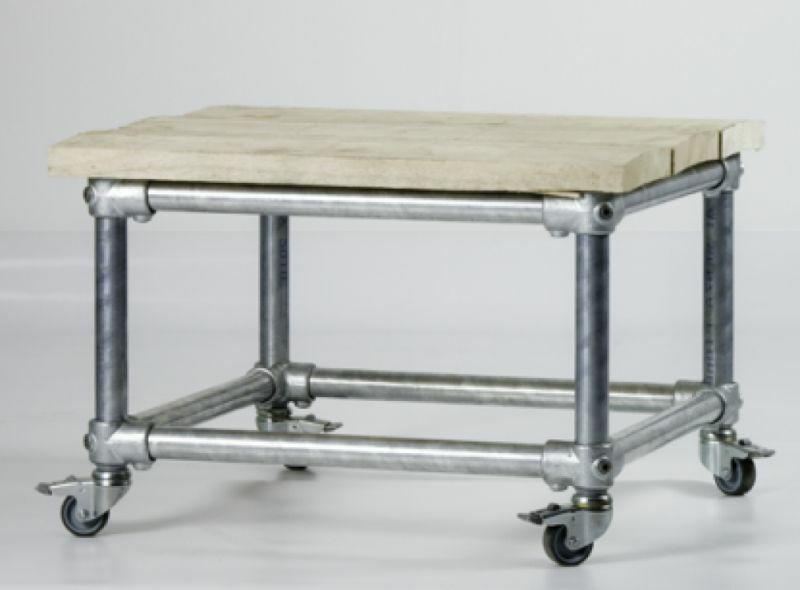 Kitchen trolley construction example for scaffold pipes. 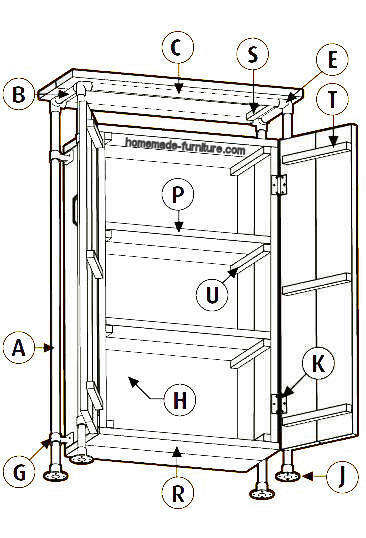 Construction plan to make a strong kitchen trolley. 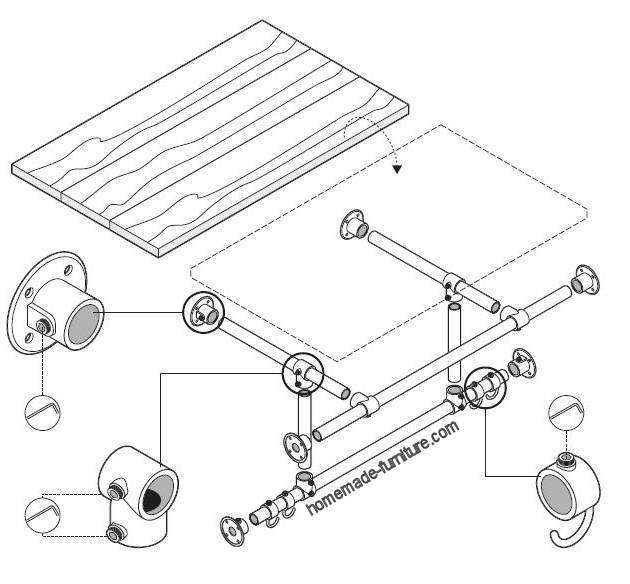 This kitchen trolley is easy to assemble by yourself. Use our shopping list for all the tube clamps and let the hardware store cut all the tubes for you. Adapt the sizes to your needs. 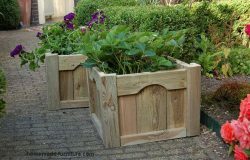 Make a large size or small trolley, with or without a lid for the garbage can. This construction drawing is mainly meant to show how these trolleys are made. Use the construction plan as inspiration, so that you can modify the trolley model to your needs. 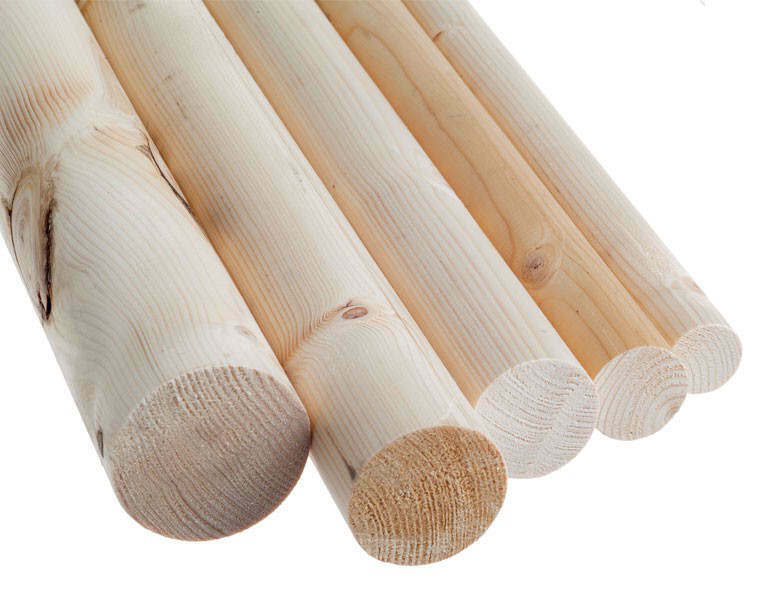 Alternative to galvanised or aluminium scaffold tubes – round wood looks more rustic. You have three choices for the tubes. Firstly, and the most used, are the galvanised pipes from scaffolds. Secondly you might choose pipes from aluminium. These aluminium scaffold pipes are more smooth, have a colour and they are lightweight. And finally you might want to use wood for the frame. Round wood is available at the sizes for scaffold clamps, but not in every hardware store. Booth on wheels, DJ table for easy assembly and transport to a gig. DJ booth for concerts and gigs, table frame on wheels. Easy for transport to a venue. These tables for DJ’s are easy to make by yourself. We have a good construction drawing which shows clearly how to fit all parts together. This booth is very similar to our other DJ table drawings as on the picture at the right. The construction plan below has the wheels under the frame as main difference. Each of these tables for DJ’s has a frame from aluminium tubes. These aluminium pipes from scaffolding are in the first place a lot lighter. Secondly they are available in several colours, and that make the finished booth look very nice. On the other hand there is nothing wrong if you prefer the steel tubes. Scaffolding tubes made of steel are a lot cheaper. 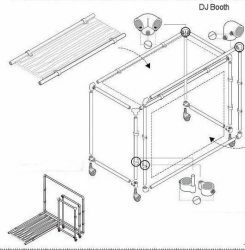 DJ booth construction example for scaffold pipes. Scaffold pipes as construction material for a transportable DJ booth. Easy transportable booth for DJ’s. Easy assembly method to make a DJ booth. 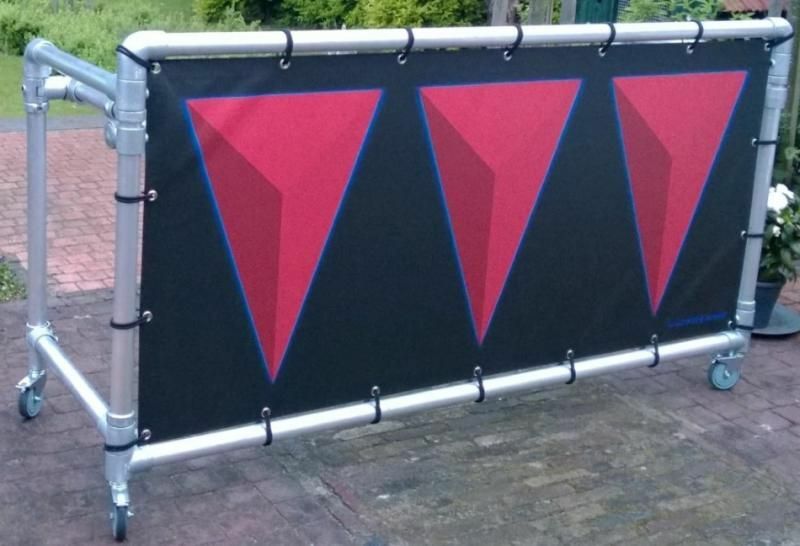 This design consists of panels that hook together with scaffold hinges. The construction of this DJ furniture takes about three to four hours. After this first assembly you will have several parts that are easy to transport. Assembly on location of the venue is very fast. You can hook all parts for the DJ booth together, the only tool that you will need is an allen key. Shelves on a frame from scaffolding tubes. How to make a strong support for wall shelves with scaffold pipes. Three shelf rack fitted to the wall. An easy and strong method to attach shelves to a wall. This is a very strong system, that is clear when you see the materials that are part of these shelf constructions. 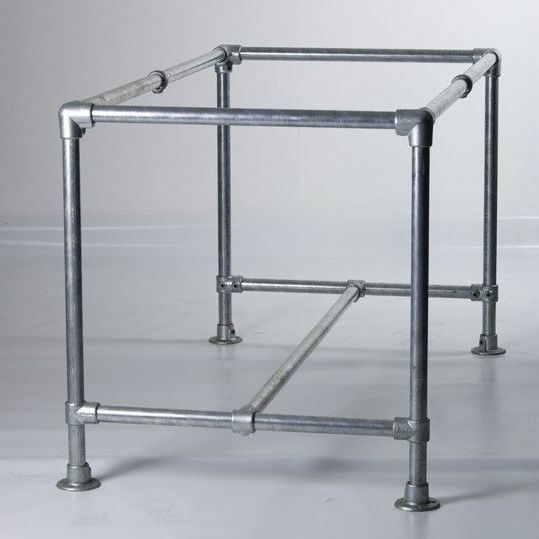 Thick galvanised tubes and clamps from scaffolds are the perfect materials to make a strong frame. Footplates assure a strong anchorage to the wall. 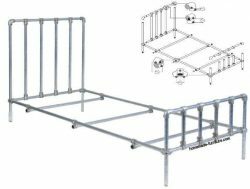 The rack on this picture has three levels, and they are supported against the wall with eight footplates, each with two or even four screws. That makes a total of 16 to 32 anchor points to the wall, for only three shelves. 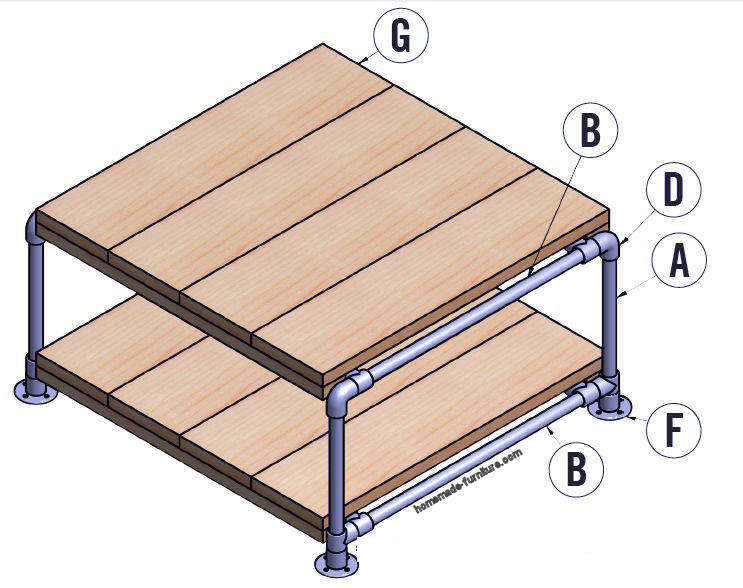 Coffeetable construction drawings for a side table from scaffold wood and pipes connected with tube clamps. 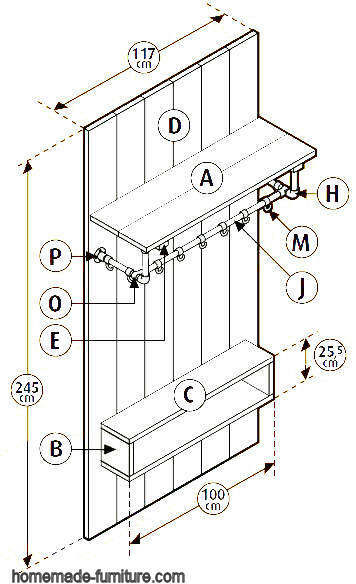 Construction drawing how to make a coffeetable in industrial style. Industrial style sidetable made with galvanised tubes and old wood. The construction of this coffeetable is similar to many of our other tables from scaffolding tubes. One of the slight deifferences is how you make the tabletop. Nevertheless it is possible to use almost any other method to construct a tabletop for these frames. You migh exchange this top for the tabletop from our bench and table frames. 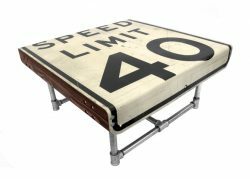 Another simple tabletop to make is from the side tables on wheels. Side table with frame from scaffold tubes and clamps. Make a low side table with industrial design. Wheels under the table make it easy to move. Pipes from scaffolding and corresponding tube clamps are the basis for this low lounge style side table. The wood are planks from scaffolding, but any reclaimed planks will do. It looks great when you use driftwood for the tabletop. But probably you will want to use the planks from the same scaffolds that provided the tubes and clamps for the side table frame. You could fit wheels under the frame. 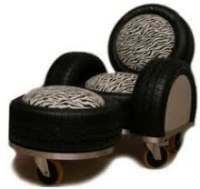 Tube chair with a frame made from scaffold tubes – adjustable inclination for the backrest. Construction drawings to make a tube chair from scaffolding pipes. 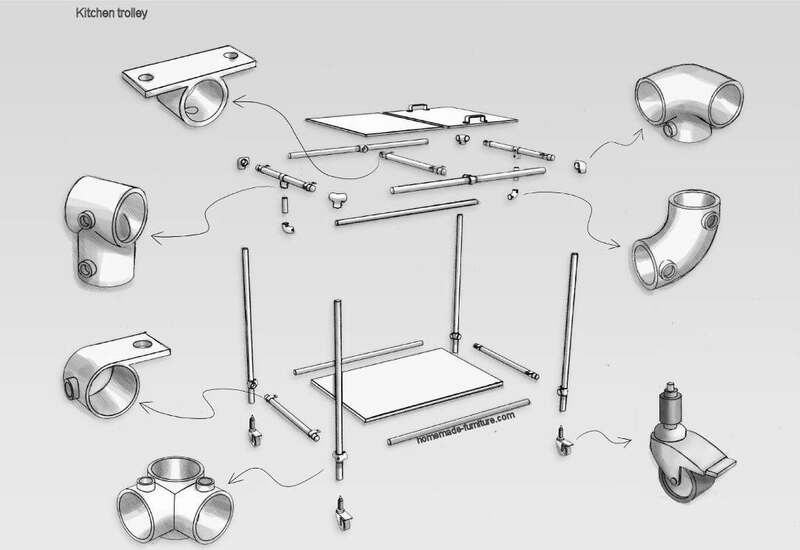 Exploded view construction drawing for a tube chair. Chairs for inside or to use in the garden. Weatherproof furniture, made with materials from reclaimed scaffolding. Steel tubes and pipe clamps in combination with thick wood from the same scaffold. 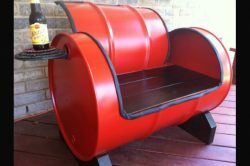 You can repurpose the tube chair parts if you are not happy with the result. Simply dismantle and recycle them in another furniture project. This wood has been outside for several years. Therefore it has a weathered look and feel to it. This wood is lightly preserved and could even be used without any woodstain. Nevertheless we advise to spend some time on a nice finish. Hallway coat hanger and wardrobe made from scaffold pipes and reclaimed wood. Vestibule rail for clothes in a hallway or dressing room. See how you can make a vestibule with industrial design. 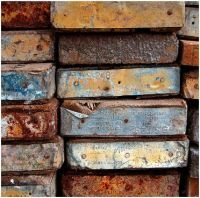 The materials are new or repurposed scaffolding tubes and clamps in combination with reclaimed planks. With these materials you will make a strong coat hanger for in the hallway, lobby or entrance of your house. This hallway vestibule is easy for self assembly. A step by step instruction is hardly needed, just have a good look at the construction drawing. 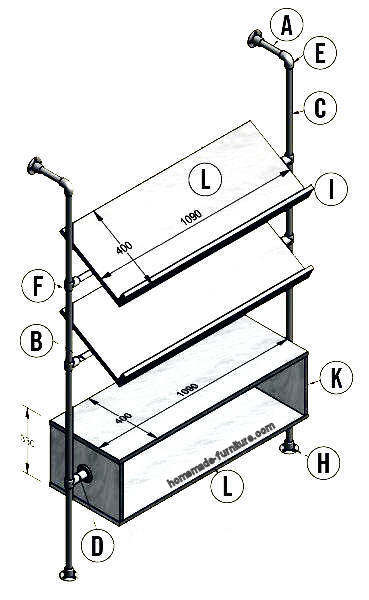 Rack for magazines and folders, free construction drawings. News stand rack for display of folders and magazines. Display shelves for literature on a wall mounted rack made from scaffold tubes. Use any type of reclaimed wood to make the shelves. We have made a list with all the parts that you will need to make this furniture. However, these are just suggestions for a quick start. You could easily change the dimensions, even the complete design. 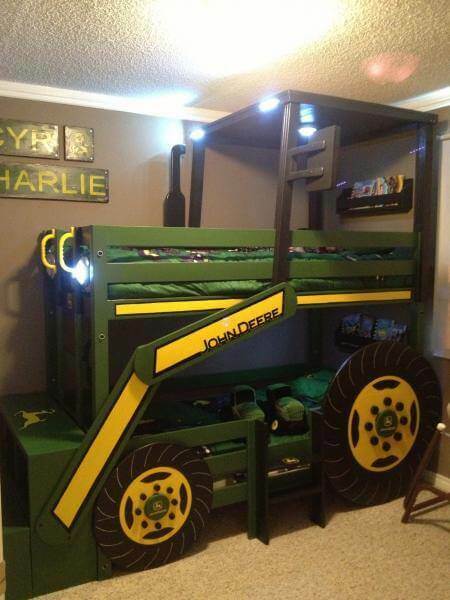 The construction materials are extremely versatile. Therefore you can make almost any shape and size for your news stand or book shelves. Cupboard with an external frame made from scaffolding pipes. 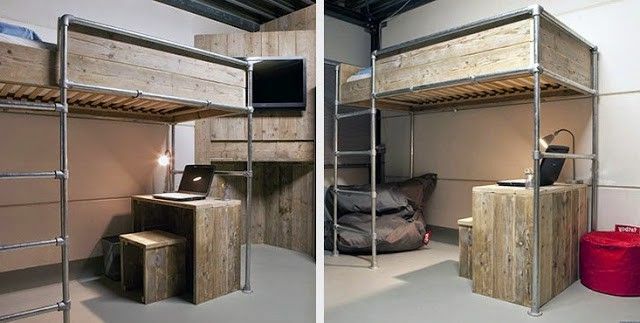 Strong design for a cupboard, made with repurposed old scaffolding. This is a very strong design to make a cupboard or chest with drawers. Its structure is firstly strong because it is made from solid wood, appoximately three centimeters thick. 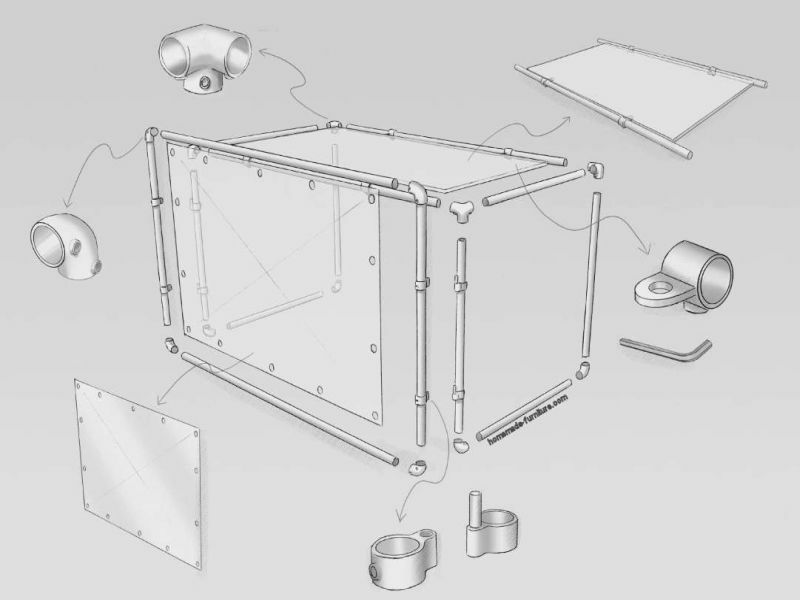 Furthermore the chest has a secondary frame , made from thick scaffolding tobes and tube clamps. Coat hanger and hallway storage unit from reclaimed scaffolding. Hallway storage unit and coat hanger. Construction drawing to make hallway furniture with old scaffold planks and pipes. 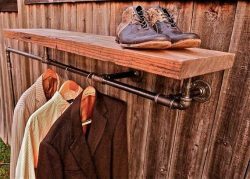 An industrial style coat hanger and shelf for hats. Storage rack with scaffold pipes with wooden shelves. Scaffold tubes storage rack with wooden shelves. 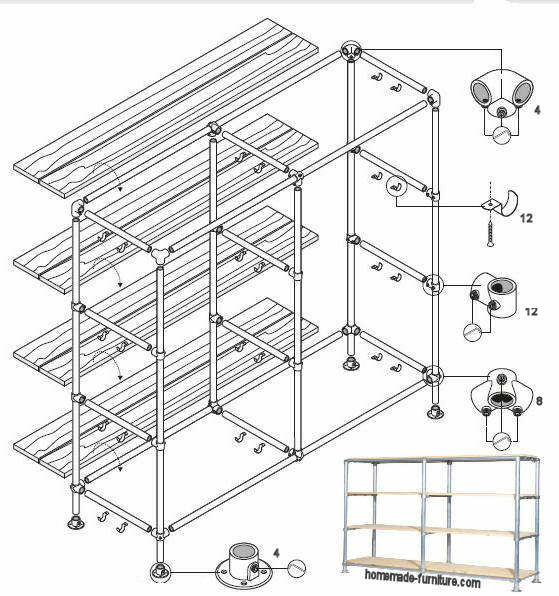 A versatile shelving unit construction drawing, made for scaffold pipes and wooden boards. You can use these scaffold constructions for many purposes. Apart from the obvious use in warehouses and storage rooms, you can also use these shelves to make furniture for in the house. TV table made from scaffolding pipes and reclaimed wood. Learn how you can make a television table without woodworking experience. Constructions with scaffolding tubes and tube connectors are very easy and straightforward. You will only need a few tools to make this tv table. All that is needed are primarily a woodsaw and a metal saw or an angle grinder. Furthermore only an allen key and a screwdriver for the self tapping screws. These are the only four, very basic tools needed, and the hand tools are very cheap as well. Easy project to make a teevision table from reclaimed scaffold tubes and clamps with a few old planks. You can assemble this TV table in less than two hours, but let’s not make it a race. Spend a bit more time for the finishing touches. 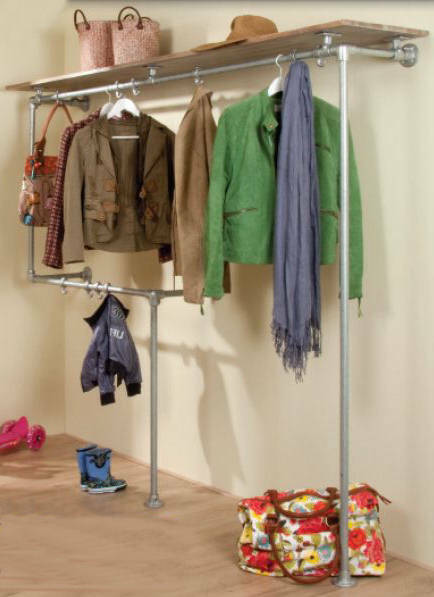 Clothes rack made from scaffolding tubes and reclaimed planks. How can I make a cheap clothes rack and rails for the wardrobe? Rack to make from scaffold rods or old plumbing tubes. A few examples how you can make racks for clothing and railings for a wardrobe. The first construction drawing is very versatile. You can alter most parts and shapes of this clothes rack. Just make sure that you fix it strongly against a wall. Even the rack itself weighs quite a few kilos. Curtain rail made from scaffolding tubes and connections for pipes. Three versions how to make a curtain rail from scaffolding tubes. 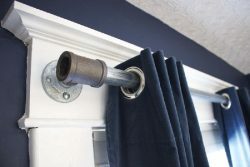 Strong connection of the curtain rod to the wall. These curtain rails are meant to be used in combination with round curtain hoops. These hook into the curtain seam, and they can slide easily over the tubing. It is a cheap construction method which will probably be stronger than any other rail. Curtains can be very heavy. 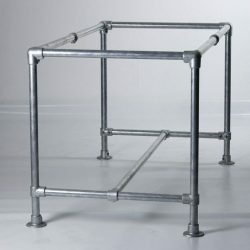 Scaffold tubes and pipes with steel connectors to make frames for furniture. 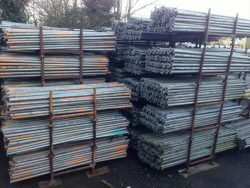 Steel frames, scaffold tubes for furniture. Easy furniture assembly and extremely strong. Do it yourself examples how you can make strong furniture without any experience. There is very little that can go wrong during the furniture assembly. Wine rack and high table. Table with wine rack and glass holders. 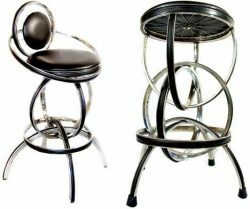 This bar table has a height that is convenient for use with barstools. It is definitely not the easiest design to make by yourself. Nevertheless it is a job that almost anyone can finish, provide that you have some patience. 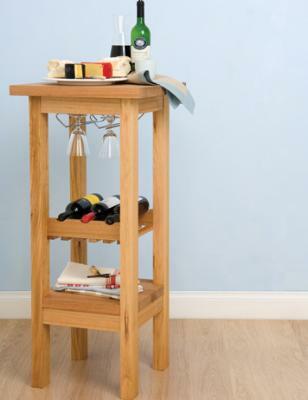 Contrary to most of our woodworking plans, this wine rack table does require a few basic carpentry skills. Bar stool construction drawings for assembly from scaffold wood. How to make simple stools at bar height. Do it yourself examples and instruction for a home made bar stool. 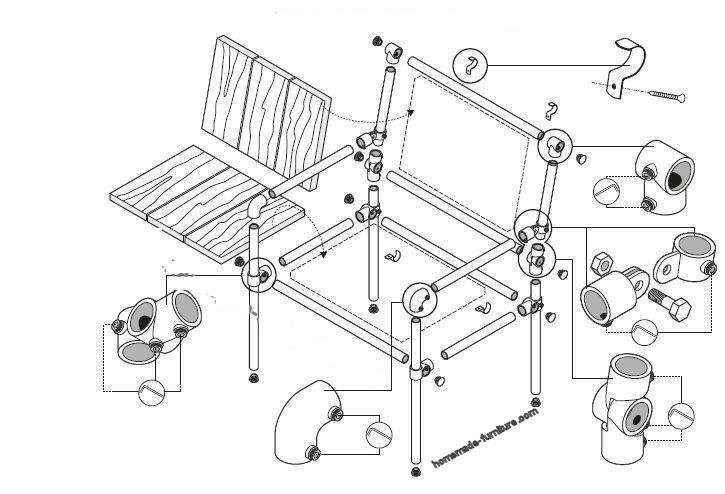 These construction drawings are similar to the stool with four legs.